The Provenance came into being in late 2017 and is a new departure for Frankie Gavin. Their first public appearance was at the Gradam Ceoil Awards on February 4th 2018 and their first full gig took place at The Everyman in Cork on February 18th. The group comprises Eadaoin Ni Mhaicin, Ciara O’Brien, Frankie Gavin and Sorcha Costello. The full line-up also includes accompanists George Grasso on Bouzouki and Brian McGrath on Piano. Frankie Gavin, recognised as Gradam Ceoil’s 2018 “Traditional Musician of the Year”, and renowned long-time member of De Danann, has now launched a brand new, high-octane fiddle group, The Provenance, to play festivals, theatres and arts centres at home and abroad. Led by Frankie Gavin, The Provenance comprises Sorcha Costello, Eadaoin Ni Mhaicin and Ciara O’Brien, three powerful, highly experienced fiddle players and stars in their own right. 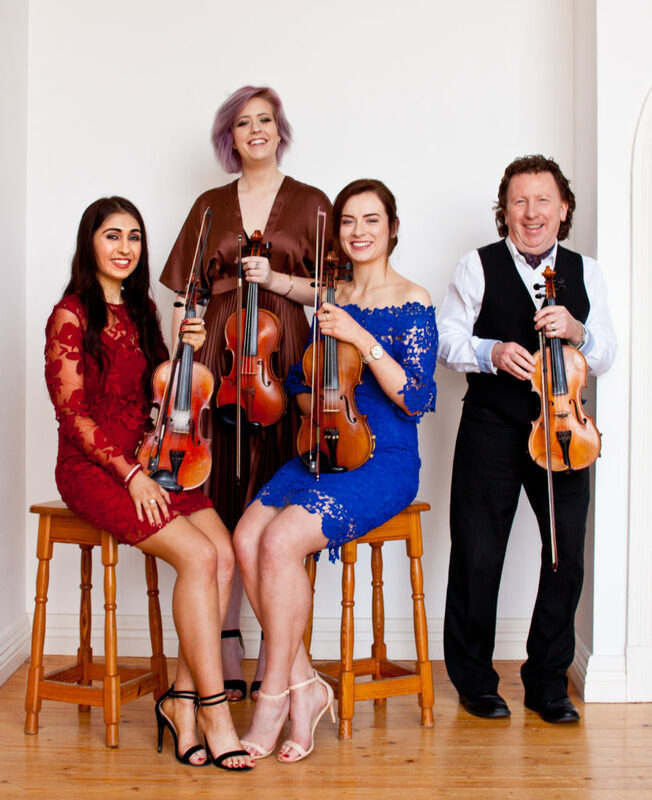 They have won numerous awards and All-Ireland competitions, and toured the world both in a solo capacity and in a range of groups and orchestras. Those familiar with Frankie Gavin’s past musical output will know that he is fiercely committed to presenting traditional Irish music in a modern context. The repertoire of The Provenance will reflect this, so expect blistering sets of jigs and reels, sprightly hornpipes and barn dances as well as slower more reflective pieces. Their first full concert, at the Everyman in Cork had the audience on their feet demanding more! SORCHA COSTELLO has been playing music since before she can remember. At a very young age she performed on stage with her mother, Mary MacNamara, in Shetland, Norway, France, Australia and Ireland. Now, in her early twenties, she has a degree in Music and English from UCC and has had an illustrious career having won various All-Ireland Fleadhanna Cheoil solo, duet and band accolades. 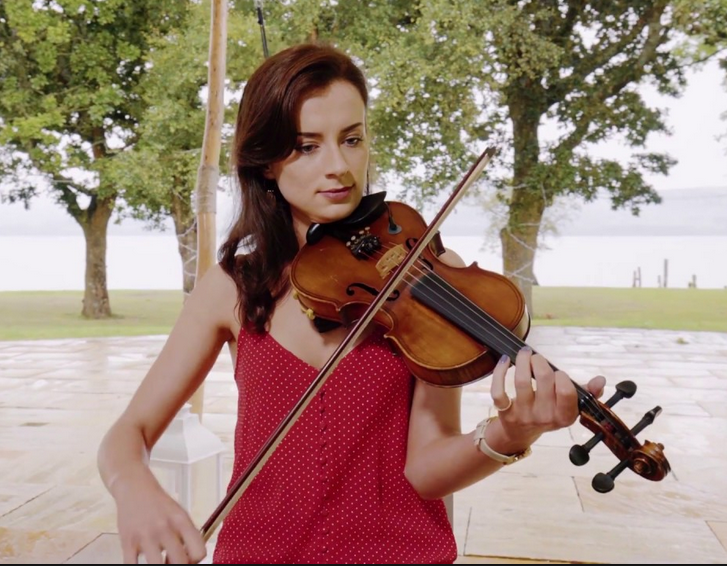 A native of Tulla, Co. Clare, Sorcha has inherited the east Clare style of fiddle playing but also has an interest in many other fiddle styles. She has performed as a solo musician on national radio and TV and continues to perform as a solo artist at festivals. On the recently released album “The Lady’s Cup of Tea” which Sorcha recorded with Mary MacNamara, the magical empathy that results from a mother/ daughter musical bond is captured. Sorcha is now a sought after fiddle teacher in East Clare. In addition to fiddle playing, Sorcha has studied classical piano and saxophone. She also has a huge interest in equine sports and athletics. ÉADAOIN NÍ MHAICÍN , from Balla in Co Mayo, is a Primary school teacher in Coolmine, Dublin. 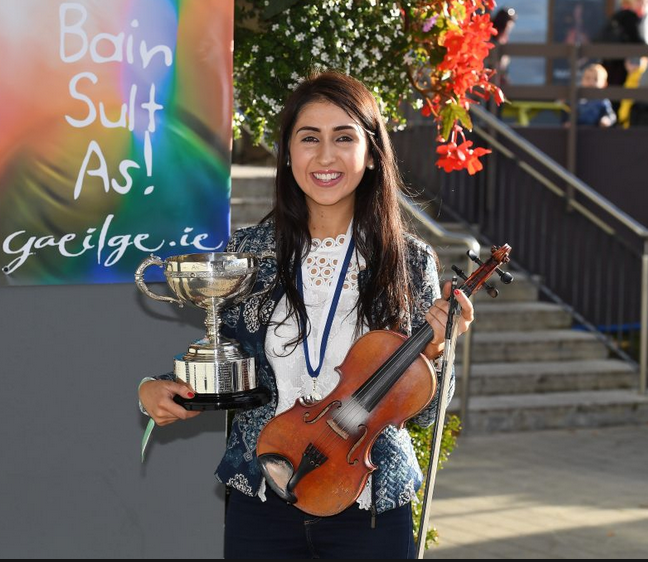 She holds numerous All-Ireland titles in the Fiddle, Harp Piano, Viola and Lilting, and was crowned All-Ireland Senior Fiddle champion at Fleadh Cheoil na hÉireann in Ennis in 2016 and at Oireachtas na Gaeilge (see photo). 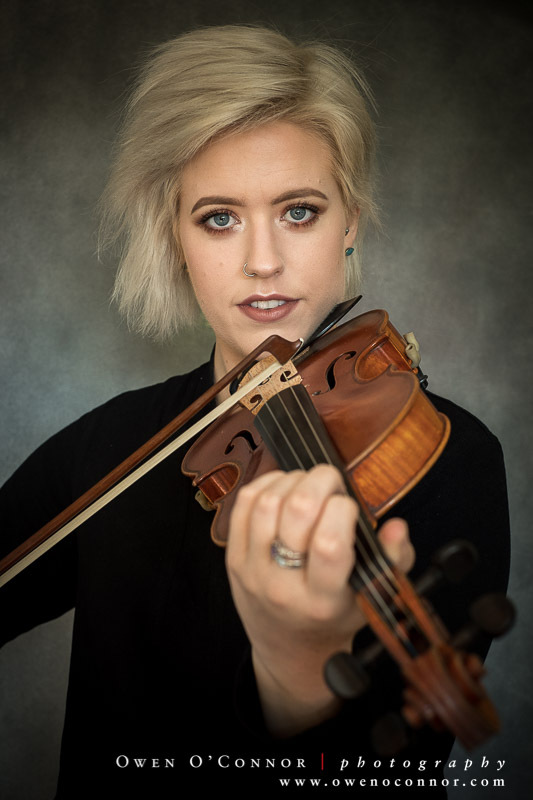 She is also a former winner at The World Fleadh on the fiddle, and has represented Comhaltas Ceoltóirí Éireann on the Concert Tour of Ireland (Macalla) in 2014. She represented CCÉ on the Tour of Britain – Echoes of Erin – in 2015 and on the North American Tour in October 2015. In August 2014, she represented Ireland at the Festival Interceltique de Lorient in Brittany where she won the International Harp Competition, Trophée des Harpes Camac, the first and only Irish winner of this prestigious award. She was a member of the National Folk Orchestra of Ireland which toured Ireland with the Boróimhe Suite in 2014 to commemorate the Battle of Clontarf (1014), and in 2016 for the performance of a new suite, Macalla to commemorate the 1916 Rising. She provides workshops abroad as well as home tuition, and adjudicates at Fleadhanna Cheoil throughout Ireland and in North America and Britain. CIARA NÍ BHRIAIN started learning violin with the Young European Strings at the age of three. When she was 12, she began studying viola with Liz Czibi in the Royal Irish Academy of Music in Dublin. She then pursued her studies on viola with David O’Doherty at the Dublin Institute of Technology (D.I.T.) where she also studied Irish and Concert Harp with the wonderful Denise Kelly. Ciara has been awarded prizes at the ESB Feis Ceoil and Sligo Feis Ceoil on both viola and harp. She won the Miscellaneous competition on viola at the All-Ireland Fleadh in 2012 and the under-18 All-Ireland fiddle competition in 2013. She has collaborated with Grammy Award-Winning producer Judith Sherman on a recording of composer Dave Flynn’s work Stories from the Old World. Ciara is the deputy leader of the viola section in the Clare Memory Orchestra, a new project initiated by Dublin composer Dave Flynn. She also performed as soloist with the orchestra at the Jeonju International Music Festival in South Korea. In recent years Ciara has been in demand as a teacher of fiddle and harp and is often invited to conduct workshops in Ireland and Europe, where she also performs regularly on radio and television. Coming from a musical family, Ciara has had the chance to perform with her father Mick and siblings at festivals around the world.